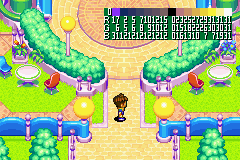 There is text for a debug menu (at x20E704) and a sound test similar to the one in Mario Golf: Advance Tour (at x4CFC4) in the ROM. 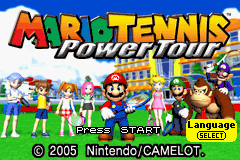 A GBA tie-in for the GameCube's Mario Power Tennis, this game removes most of the Mario characters to make room for the story mode, which takes place after the Game Boy Color Mario Tennis. Your goal? 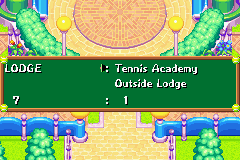 Become the best tennis player ever! The debug mode can be enabled with 03001334:00000001. 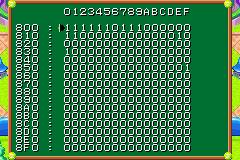 The controls are similar to the debug modes found in other games made by Camelot. Holding L will allow you to walk through walls. Press L+Start to open the Palette Menu. 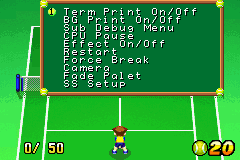 Press B+Start to open the Warp Debug Menu, which will allow you to go to any room in the game. Press B+Select to open the Story Book Flags Menu. Pressing Start + Select should make the frames pause; button presses will advance frames. Press Start to resume as normal. See if the debug mode does anything else. Document what each flag does. Document all of the possible values for each map in Warp Debug Menu(the number that can go from 0-99) These numbers DO have significance. There are some unused maps and test maps accessible from the warp debug. Document these. There is data present that proves Chet, Sass's doubles partner in the Island Open, was to be a playable character. However, his programming is incomplete. 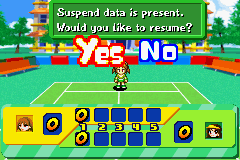 He appears in the match as a distorted, colored square, and said square actually has Clay's sprite present. Also, Chet can't hit the ball far at all. Even with a "NICE!" shot, it still only moves forward a few inches. As a result, Chet is completely unusable. Also, the only unused graphic associated with this is his player icon. There are also two other player slots, possibly for two of the other three Island Open players that can't be unlocked. The slots are labeled "08" and "47", respectively. Their icons look like placeholders, and their playing is the same as Chet's. The two main characters are named Clay and Ace in the US version and Max and Tina in the European version. In addition, the US version allows you to select other European languages in the options menu. This page was last modified on 12 October 2017, at 13:18.